Higher education students' use of technologies has been documented over the years but their specific use of technologies for assessment-related tasks has yet to be fully investigated. 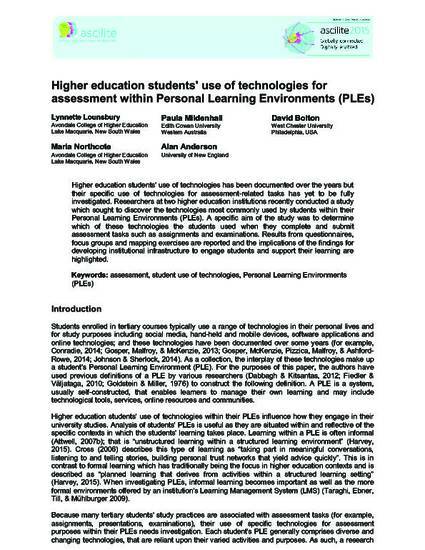 Researchers at two higher education institutions recently conducted a study which sought to discover the technologies most commonly used by students within their Personal Learning Environments (PLEs). A specific aim of the study was to determine which of these technologies the students used when they complete and submit assessment tasks such as assignments and examinations. Results from questionnaires, focus groups and mapping exercises are reported and the implications of the findings for developing institutional infrastructure to engage students and support their learning are highlighted. Used by permission: ASCILITE and the authors. This conference paper is made available under the terms of the Creative Commons by attribution licence.